Voices New Zealand Chamber Choir was formed in 1998 with Dr Karen Grylls as its Music Director www.choirsnz.co.nz/voices/members . As a nationally selected choir of the highest calibre, Voices NZ is a chamber choir that is flexible in size and capable of performing a wide repertoire. Many of the singers are alumni of the New Zealand Youth Choir. The choir made its début at the 1998 New Zealand International Arts Festival in a recital with the New Zealand Chamber Orchestra and Keith Lewis. Later that year it won gold and silver awards at the Tolosa International Choral Competition in the Basque region of Spain. Since then the choir have collaborated with the prestigious Aradia Ensemble from Canada, resulting in the completion of a world premiere recording of the Vanhal Masses for Naxos, participated in the Otago Festival of the Arts, and concluded the year by recording a CD which features New Zealand repertoire and composers, winning the Best Classical Album at the 2006 NZ Music Awards and represented New Zealand at the 9th International Chamber Choir Competition in Marktoberdorf, Germany. In 2010 Voices NZ joined several other choirs and the New Zealand Symphony Orchestra in a performance of Mahler’s Symphony No 8, conducted by Vladimir Ashkenazy. In August 2011 Voices NZ was one of the 24 international choirs appearing at the 9th World Symposium on Choral Music in Puerto Madryn in Argentina. In 2013 Voices NZ joined the NZ Youth Choir for acclaimed performances in the Auckland Arts Festival for concerts celebrating the centenary of Benjamin Britten. The Voices New Zealand Chamber Choir has recently released a recording for Atoll www.atollcd.com entitled Voice of the Soul. 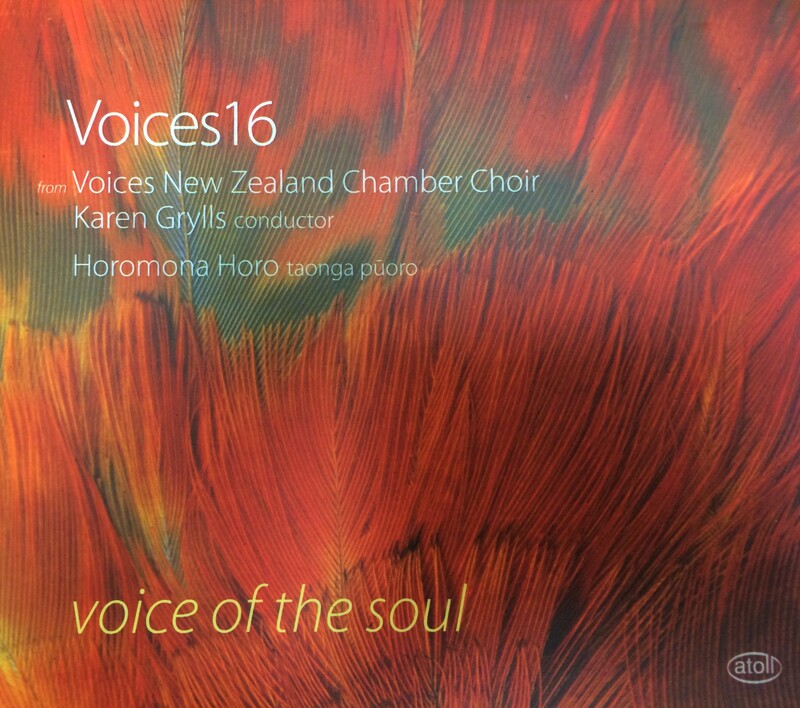 As a flexible choir of between 16 and 32 voices, on this new recording they are shown as Voices 16 from the Voices New Zealand Chamber Choir. This new disc features Taonga pūoro, traditional Māori instruments, alongside the choir in a repertoire that ranges from Hildegard von Bingen to contemporary works as well as traditional Māori instrumental interludes that are intended to act as a kind of promenade for the listener walking around a gallery of musical sensations. Hildegard von Bingen’s O Viridissima Virga opens with the striking, deep hollow sound of the Pukaea, a type of wooden trumpet, resonating as the voices enter with Hildegard’s timeless choral sound floating above the background of the instrument. Soon the choral part fills out as the male voices add Maori texts and the sound of the Putorino, a Māori instrument that can act as a trumpet or flute, joins creating a strange and lovely texture. Beautifully done. David Childs’ (b. 1969) www.sbmp.com/ComposerPage.php?ComposerNum=57 Salve Regina (1998) rises up with this choir providing a lovely blend of voices, pure yet with a robustness. There are some fine, accurate staccato phrases as well as contrasting textures between different sections of the choir to lovely effect. This is beautifully written and sung. The first interlude features the traditional Maori Pukaea again providing some earthy sonorities that are so evocative. Morten Lauridsen’s (b.1943) http://mortenlauridsen.net Six Fire Madrigals opens with Oc’e, Lass’ll Bel Viso presented in a slightly declamatory style before a flow is developed, these singers fully able to move naturally from the intense to flowing character of the music with some inspired static moments. Quando Son Piu Lontan has a gentler nature, an exquisite setting of a madrigal text with this choir weaving a superb tapestry. The upbeat Amor, Lo Sento L’alma shows this choir’s terrific vocal agility, terrific accuracy whereas Io Piango reveals some fine harmonies, superbly done by Voices 16, rising in drama before falling back to a gentler nature with some fine vocal control and sensitivity. Lui Serene E Chiare brings more fine harmonies with a theme that would test any choir with its wide intervals, very finely sung here. The more reflective Se Per Havervi Oime has some lovely little decorations beautifully and subtly done. The second interlude brings the strange wind sounds of the Purerehua, a bullroarer, to which a plaintive wind melody is added leading into the next work, Helen Fisher’s (b.1942) http://sounz.org.nz/contributor/composer/1041 Pounamu. The choir enter over the Maori Kōauau tia, a small flute, bringing a lovely texture that slowly opens out with some beautiful sounds. There is some lovely use of voices and instruments as this composer develops different blends and harmonies. Another terrific piece. The third interlude features the Poiawhiowhio, a musical instrument made by hollowing a gourd, drilling holes on either side and attaching a cord by which it can be swung around the head creating a whistling, chattering voice and a Karanga Manu that enables the player to mimic several kinds of bird calls. These two instruments bring the sounds of nature in this lovely link between works. Christopher Marshall’s (b.1956) www.vaiaata.com Horizon I (Sea and Sky) rises out of the preceding instrumental interlude beautifully, with a gentle sway over which the text is sung is given. Benjamin Britten’s (1913-1976) www.brittenpears.org Five Flower Songs, Op.47 sit remarkably well along the other works on this disc. To Daffodils brings a lovely freshness of voice before they build some beautiful harmonies in The Succession of the Four Sweet Months, a lovely layering of voices. There is a buoyant Marsh Flowers with Voices 16 showing complete mastery of Britten’s difficult harmonies and intervals and The Evening Primrose where this choir brings a wonderful quality, perfectly blended, subtle harmonies, beautifully controlled. They bring superb accuracy and ensemble in the light hearted yet fiendishly difficult Ballad of Green Broom. David Hamilton’s (b.1955) www.dbhmusic.co.nz Karakia of the Stars opens with bell like timbres of the Tumutumu, a percussion instrument which can be made from various types of stone and other materials such as wood and bone. The voices gently enter with a fine sonority before a very fine solo soprano voice comes in over the choir. Another soloist appears whilst, throughout, these two evocative instruments add to the texture. There is very fine singing from the choir in the unusual harmonies evoking the New Zealand landscape, rising centrally to a rich, powerful peak before falling when the Kōauau porutu, a long Koauau with finger holes near the bottom end giving it the ability to jump between two octaves, enters. The choir rejoins with the Tumutumu reappearing with whispered voices as the music fades into the elements. The Purerehua returns with its whirling sounds making an evocative conclusion. This terrific choir show a tremendous versatility in this varied yet totally cohesive concert that creates some especially fine atmospheric moments. They receive an excellent recording made at the Kenneth Myer’s Centre, Auckland University, New Zealand. There are informative notes though some more information about the traditional Maori instruments would have been welcome, though some of instruments used are illustrated.